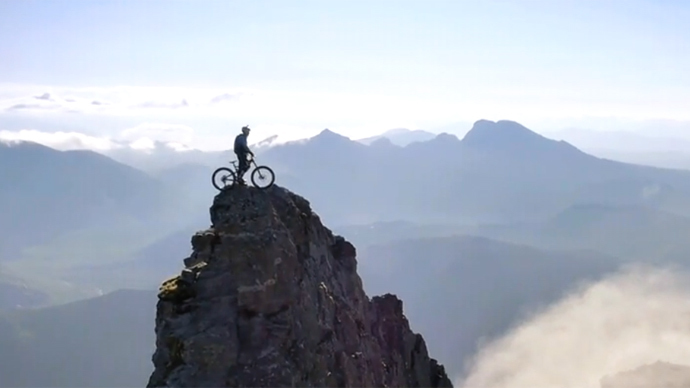 In a stunning new video, a 28-year-old trials cyclist Danny MacAskill tackles the never-before-ridden Cuillin Ridge in his native Scotland, to and from the pinnacle. The death-defying ride features sheer cliffs, rugged peaks – and unbelievable stunts. MacAskill’s adventure was captured in thrilling cinematic fashion by Stu Thomson and his team at Cut Media, supported by Five Ten and ENVE Composites. The bike rider also used a first-person view camera offering dramatic views of heights and chasms inches away from his chosen trail. To make his trip extra cool, MacAskill chose to arrive to the foot of the cliffs by rowing boat – and conquered the sheer Inaccessible Pinnacle at its apex, never parting from his bike. The resulting seven-minute video called ‘The Ridge’ was posted on video sharing site YouTube on Thursday and instantly went viral, with the counter showing more than 3,300,000 views as of Saturday evening. Fascinated viewers took to social media to discuss the effortless way the stunt cyclist jumps over huge rocky gaps and makes flips in places that few men would dare to climb. 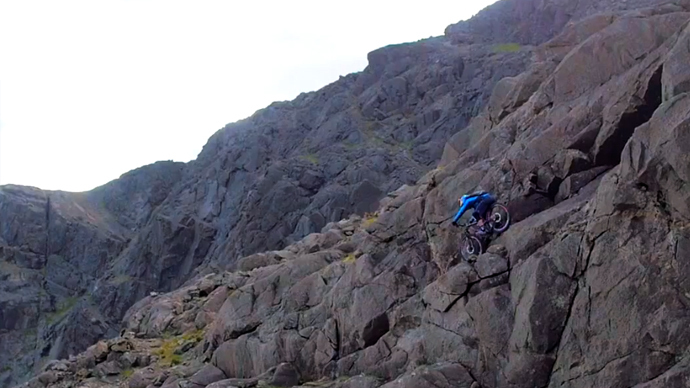 The rugged traverse on the Isle of Skye is a challenge for pro-level climbers, let alone cyclists. The Inaccessible Pinnacle is the hardest of the Munros to scale, the company notes. In some places, the terrain was too extreme for biking, so MacAskill would carry his Santa Cruz full suspension bike over his shoulders, hiking past the gnarliest parts of the traverse. A documentary about the attempt will air on the UK’s BBC One next Friday. 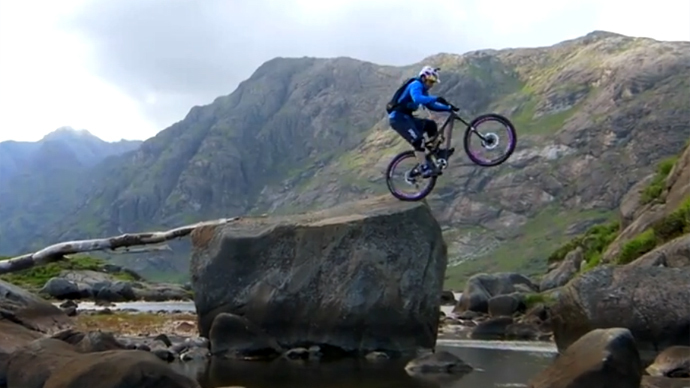 MacAskill is known as one of the world’s most fearless trial cyclists. He began documenting his exploits in 2009, when he released a 5:30 minute street trials video on YouTube set to ‘The Funeral’ by the Band of Horses. Since then, the Scotsman’s notoriety has only grown with each viral video. As ‘The Ridge’ was posted on Cut Media’s YouTube page on Thursday, it started gathering literally a million views a day, and attracted thousands of likes and comments on socialmedia.